This beautiful long new hall is completely dedicated to the leading figure of the Venetian school: Titian, also well known by his Italian name, Tiziano. Great portraitist, Tiziano Vecellio (1488-1576) was very much sought after by all of the rich and famous European courts during his time. Tiziano is perhaps the supreme exponent of Venetian painting together with his masters, the brothers Giovanni and Gentile Bellini and his famous colleague, the enigmatic Giorgione (whose work you can admire in the previous hall, number 75. Venetian Renaissance painting always privileged color over drawing, just the opposite of what happened in Florence, where the drawing tradition was stronger. Moreover, the humid climate of the lagoon did not allow the fresco technique or the use of wooden boards, more vulnerable to damp. For this reason, the oil technique and the use of the canvas spread more and more. From a stylistic point of view, Venetian painting focuses on the color and its shades, as well as on the landscape, the light, and the relationship between man and nature. In this room, you will be able to admire works by the great Tiziano, including the most famous, the Venus of Urbino (1538), a masterpiece of sophistication and sensuality. Another precious work to stop and admire to the right as you enter the room, is Flora (c. 1515-1517). 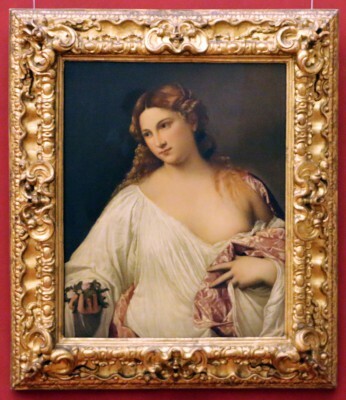 The sensual image was greatly admired long before it arrived in the Uffizi’s collection in 1793, after an exchange with the Imperial Gallery of Vienna. The beautiful woman appears as the Goddess of Fecundity but it is also a portrait of a future wife, with similar symbols employed in his more famous Venus of Urbino. All in all, the hall now has 10 works by Tiziano visitors can admire, from the portraits of the Duke and Duchess of Urbino, Francesco Maria della Rovere and his wife, Eleonora Gonzaga, to the portraits of a bishop and pope.